Although we learned about the NPA- Twin balance sheet problem in last year’s lecture series (BES161) but since the new economic survey and budget have mentioned the same topics, and UPSC has not yet asked substantial number of MCQS from here, so we’ve to recap. As of 31 December 2015, the total non-performing asset of scheduled commercial banks in India have stood at 9.6 lakh crores. Majority of this NPA is concentrated among the public sector banks (PSBs). Economic survey notes that the level of NPA in Indian economy, is among the highest in the BRICS nations! 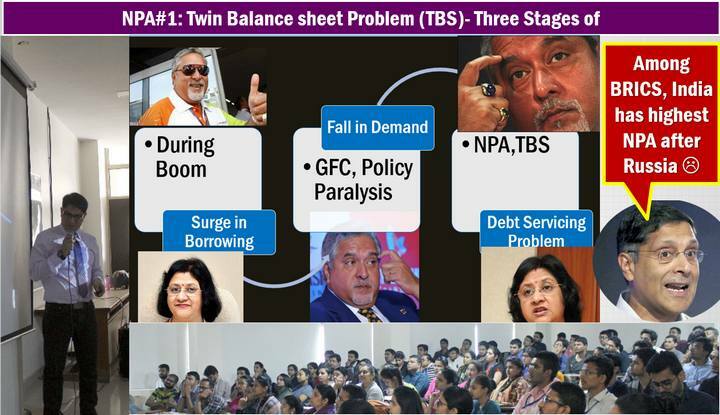 This NPA problem has created stress in the balance sheets of both the corporate and public sector banks, hence a new term was coined “twin balance sheet problem”. CEA Arvind Subramanian has outlined three stages in which this cancer has spread in the Indian economy 1) before the sub-prime crisis, there was a surge in borrowing 2) after the global financial crisis, there was a fall in demand 3) ultimately, corporates had debt servicing problems to a point where their revenue was insufficient even to pay for the interest. Although, India’s case is unique because despite such high level of India, our economy has not collapsed, or come to a standstill, unlike those advanced economies after the sub-prime crisis, or those East Asian tigers after the crisis of 1997. Survey projects two scenarios of the NPA/TBS problem: 1) phoenix 2) containment. Because of this problem, banks have become reluctant in their lending operation especially the micro and small enterprises. The decline in the profitability, has also led to fall in the share prices of public sector banks, some of them even selling below their face value. Non-Performing Asset (NPA), Substandard Asset, Doubtful Asset and Loss Asset. 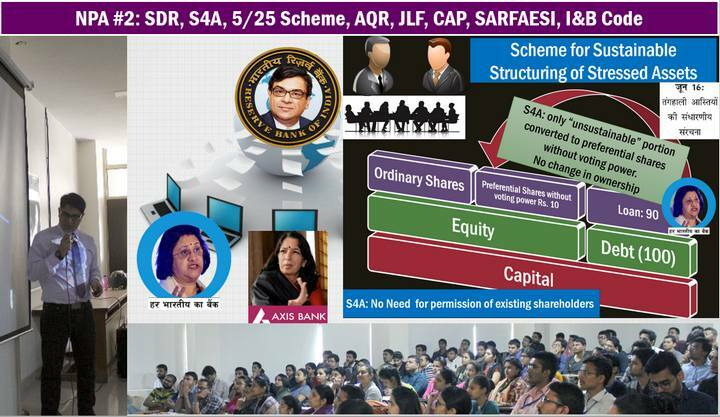 CEA Arvind Surbamanian believes that since the earlier ‘alphabetical soup’ of schemes (AQR, SDR, S4A, I&B Code etc.) 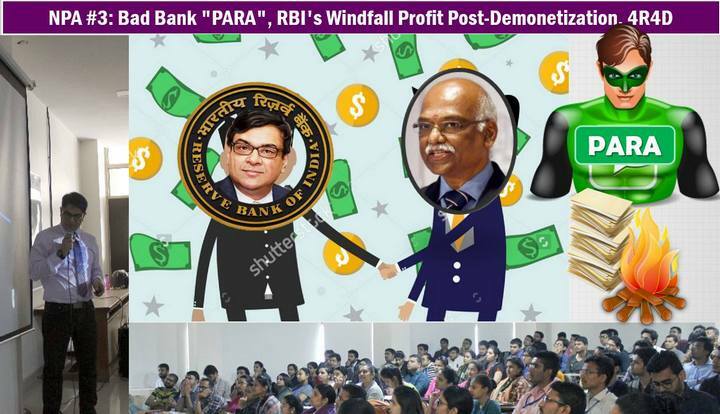 has failed to solve NPA problem, and since 40% of the NPA is concentrated only in 60 firms, so better we create a centralized agency known as Public Sector Asset Rehabilitation Agency (PARA), which will work as a “Bad bank” and absorb the losses from the PSBs. But where to get the money to absorb these losses? Subramanian suggests that the demonetization of Rs. 500, and Rs.1000 rupee notes will create windfall profit for RBI, from which, this bad bank endeavor can be financed. How far is his assumption valid? We’ll see in this video. Economic Survey also warn against the moral hazard i.e. once NPA problem is settled, the Bankers may become complacent and again resume reckless lending. Therefore, systematic reforms are required to improve the governance and administration of PSBs, for this, Subramanian and others have suggested many reforms, such as 4R4D framework, Banking investment company (BIC), Bank Board Bureau, Indradhanush Roadmap etc. all of that is compiled in this last part of the NPA lecture series. Can you please confirm whether this statement is true or false? Public debt management cell (PDMC) has been set up under RBI. Sir is it possible to prepare for upsc with 9 to 5 job…i m in dilemma that if i put my 100% efforts excluding that time. Am i be able to clear my exam?? Dear Mrunal, thanks for explaining the concepts in such lucid manner. I am very much thankful for your efforts. Mrunal Sir, really appreciate your high quality content which shows the effort you and team put in and make it easy for the candidates. However, due to the less time available, it becomes impossible to revise. Request you to pls upload the remaining classes a bit early so that some revision and hence retention is possible. Otherwise, the entire exercise in the end does not produce the desired result. Sir, please update us about your plans to update the future videos. Where is Pratik Nayak Sir… No Lectures this year…Missing Him badly…. Eagerly waiting for the remaining videos on BES 17. As mentioned above by few, revising this core subject is very crucial. Lest info overload towards the end disrupts the revision pattern. Thank u so much Sir for ur assurance of uploading the lectures before prelims. The time and effort is totally understandable for a work so organised, perfect, simple, precise yet exhaustive like ur videos. Stay blessed and happy. The answer is both yes and no. It all depends on your attitude. Sir, please upload BES171 videos as soon as possible. Sir please ask Pratik sir to continue with ancient and medieval history. The videos are a great effort from you and it really helps us to clear our concepts of complex topics. However, considering this year RBI Grade B & UPSC-Prelims are going to be on the same weekend which is not that far, it would really be helpful to us if you can finish up the entire course by 1st week of June, which will leave us about 10 days for revision. Eagerly waiting for your videos. Sir please provide a blue print of BES17 series so we can prepare better for prelims.Thanks for your ALTRUISTIC EFFORTS . anyone plzzz tell me that i should study ncert material from this site or should buy paper books of new syllabus ???????????????? Sir, if you are not able to post the videos, please post a notice telling us that. Many of us had planned our Economics schedule with your videos and if you can’t complete them, we will try to finish our syllabus ourselves. Akash Bhai Bhagwaan k bharose mat baitho kya pata bhagwaan tumhare bharose baitha ho…try to complete it on your own and asap. Also do as many revisions as you can before exams. Till now 24 videos have been uploaded in BES17 series but only 14 ppts are available for download. Are all these 24 videos enmeshed in these ppts or some more ppts shall be made available for download anytime soon? Sir, how to prepare for finance and management paper phase 2 of rbi graDe b exam ?